Bastille Day is July 14! In honor of the French Independence Day, why not celebrate with a nice cup of French café? If you’ve ever ordered coffee in Paris or anywhere in France (or even at a French restaurant in the US), you already know that the coffee they serve there is very different from American coffee. Strength– First of all, coffee in France is much stronger than American coffee, more like espresso – unless you order the Americain. Most French can’t understand why Americans drink “watered down” coffee. Etiquette – There is a definite etiquette to drinking coffee in France. 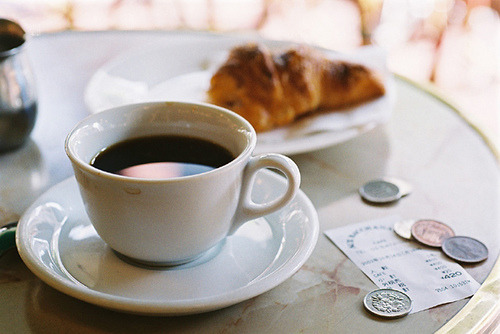 Coffee or un café is only consumed with food in the morning (ie. breakfast). Forget about ordering it with dessert! Your server will bring it after. Selection – Coffee in France is FAR from being made-to-order. Don’t even think about getting picky and asking for 1/2 regular 1/2 decaf, or skim milk, etc.! However, there are a number of different ways that French coffee can be ordered. The key is to know how each café is prepared, then sample a few to find your favorite. Un Café (kuh-fay) Plain coffee, no sugar or milk. It’s very strong – similar to espresso. Un Café Crème (kuh-fay khremm) Coffee served with ½ hot cream. Un Café Décafféiné or Un Déca (kuh-fay day-kah-fay-uhn-ay) Decaffinated coffee. Un Café Noisette (kuh-fay nwah-zett) Espresso with a hint of milk or cream. Un Café Americain (kuh-fay uh-meyhr-uh-kan) Filtered coffee that is similar to traditional American coffee. Café Léger or Un Allonge (kuh-fay lay-zjay; ah-lohn-zhay) Espresso coffee with double the amount of water, making it a rather week version of black coffee. Un Espresso Very strong espresso! Un Serré Espresso coffee with half the usual amount of water. Un Double A double espresso. Café glacé Iced coffee -a summer treat, even in France! Once you mastered the art of ordering your French café, add to the fun by ordering a baguette with jam or a flaky almond croissant – the perfect accompaniment – as long as you order it in the morning! I love coffee (and tea). This is such a good guide for people that have no clue what to order in different countries–other European countries are similar in the issues with strength, and don’t even get me started on coffee in Turkey or Greece! I’ve been making a conscious effort lately to enjoy my coffee rather than just drinking it out of habit.